I will be the first to admit that it’s been far too long since I’ve updated this page. I do, however, have a good excuse. I’ve been on the river nearly every day, and it’s been a great summer. I’ve been doing a lot of different things, and I’d like to give some highlights and some current reports. In the last few days we have had a major weather change, cooler weather and showers ushering in fall; probably the best time of year to get out and go fly fishing in Oregon. In the next couple of weeks hatches on the McKenzie and Willamette should improve. In September and October we get great hatches of October Caddis, Gray Drakes, and various smaller insects. 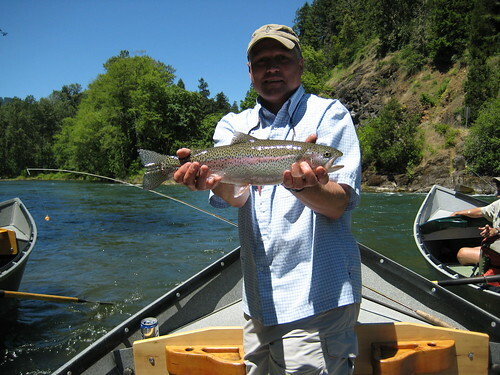 The fish are looking to consume as many calories as possible before the onset of Winter, and the trout fishing is great on both the McKenzie and Middle Fork of the Willamette. 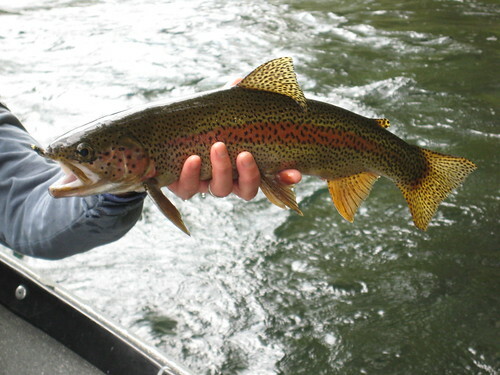 The trout fishing generally will hold up nicely through the end of October. 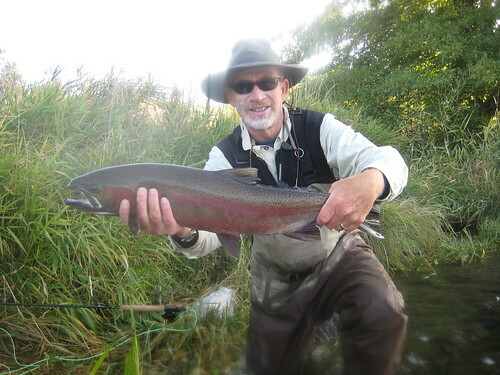 I have been spending a good deal of time of late fishing the summer steelhead run in our local rivers around Eugene. 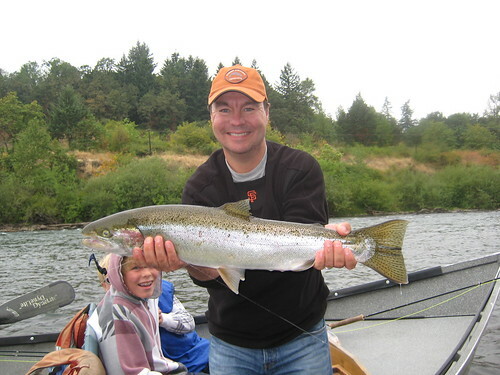 The return of adult summer steelhead to the Willamette River system this year was only average, but pressure has been relatively light, the water temperature is nice and cool, and the levels are good. I have enjoyed some exciting mornings of steelheading lately, with the fish responding well to swung flies. 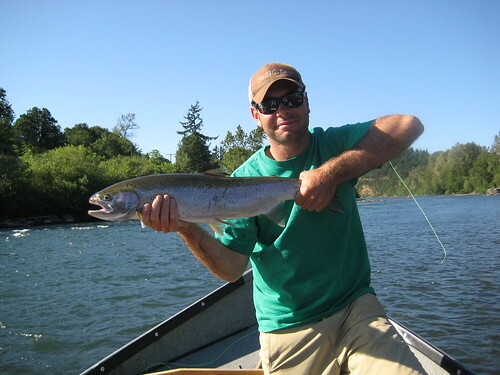 As we move into fall, the fishing on the McKenzie and Willamette for steelhead will generally improve. Because the water level on the Willamette is a little high currently, I have been doing best swinging relatively big flies on a sink tip line. Favorite patterns include MOAL leeches, various prawn patterns and intruders. 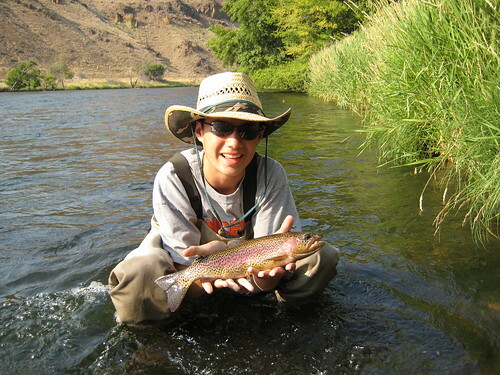 It was another good summer on the Deschutes as well, with good hatches of small caddises. The dry fly fishing was generally good with fish responding well to small caddis imitations as well as various attractors. We did a number of multi-day Deschutes trips between Trout Creek and Maupin throughout the summer months, and while the fishing varied trip-to-trip, it was relatively good throughout July and August with good numbers of rising fish, and the trout responding well to nymphing tactics as also. In the summer months, many of the native Redsides on the Deschutes will move into eddies and slow bank water to feed on prolific hatches of small mayflies and caddises. While this type of fishing isn’t always easy, stalking big rising trout is always entertaining and rewarding. While the hot days of summer can make for slow fishing on some rivers, this time of year offers some of the best dry fly fishing of the year on the Deschutes. 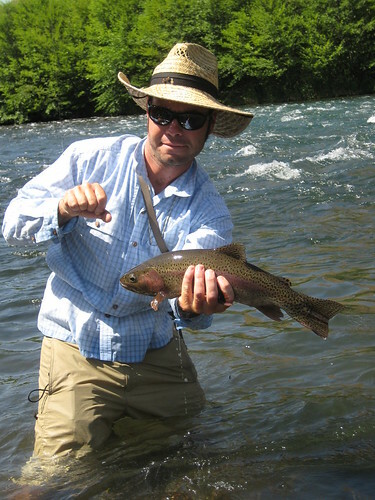 In general, the hotter the weather, the better the caddis hatch, and the happier the fish. Though daytime air temperatures can sometimes push 100 degrees, we stay comfortable stalking trout while wading wet in the river’s cool flows. As we move into fall, the trout fishing should hold up nicely. Soon the annual October caddis hatch will grace the river with its presence, bringing some of its nicest fish near the surface to feed. Blue Winged Olives will also become important, with a good number of duns emerging by late morning most days. The small caddises the fish have been feeding on throughout the summer will also remain important until the end of October. 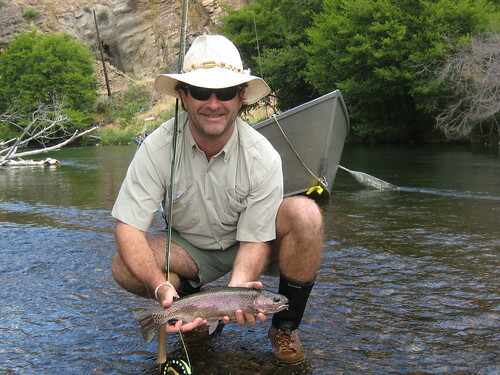 This is the time of year that we start to get very excited about fishing for steelhead on the Deschutes. With good numbers of fish already in the river and record-setting fish counts on the Columbia, it should be a great fall on the Deschutes. These fish generally respond very well to swung flies fished near the surface. Many of the best flies here are traditional wet flies, sparsely dressed. My favorite is a Silver Hilton (#4). Though it was still a little early for big numbers of steelhead in the Trout Creek to Maupin stretch, I did a multi-day trip there a couple of weeks ago and my guests hooked a couple steelhead over the course of the trip while fishing for trout. 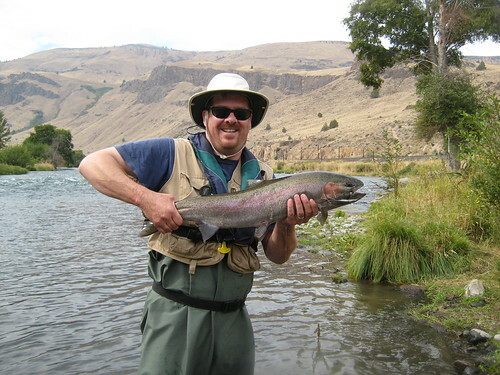 Numbers of steelhead in the Deschutes will only improve throughout the fall. Though I have most of the rest of the summer and fall season booked, I still have a good deal of availability here and there. If anyone would like to get out on the river and enjoy some of the great fishing that Oregon has to offer, please call or email! The fall is probably the best time of year to fish here for trout and steelhead, and it will be over before we know it.